Right now I am supposed to “travel into the lush highlands of the large island of Santa Cruz where wild tortoises forage” but instead I am in my livingroom updating my website. How did this happen? Last Friday I flew to Ecuador and met up with my family for our first family vacation of the 21st century. My parents both turn 70 next month and after talking about going to the Galápagos for many years we finally booked a trip. The next day we loaded a bus with dozens of families and couples my parents age and headed to the airport. We flew to the tiny island of Baltra just north of Santa Cruz. It’s one of only two airports in the archipelago, a former US army base during WWII. We landed in a world that when combined with the long customs lines felt very much like we were entering Jurassic Park on opening day. The John Williams score was stuck in my head all day. After our bags were searched for any sort of invasive species we got on another bus which took us to a tiny dock where a sea lion napped in the shade of the benches. Across from there was a shack that sold giant bottles of beer as a large land iguana crawled past the line. Pelicans and bright red crabs sat on the rocks around the docks and huge schools of tiny fish zipped past us. We boarded Zodiac boats piloted by men who looked like bandits covered from head to toe to protect them from the harsh equatorial sun. We finally boarded the Endeavor II, the boat that we were to live on for the next week, but just 24 hours later we were on a Zodiac back to the same Baltra dock and on our way to the hospital in neighboring Santa Cruz. The rest of the day was spent in a series of meetings. We had a evacuation drill and learned the national park rules and met the crew of the boat. There was an overview of the trip and some lessons from naturalists and countless reminders to bring water and sunblock everywhere. Finally we went on our first excursion, a short walk around Las Bachas, a beach named after WWII army barges dumped into the sea when the US left after the the war. The walk served as an introduction to the trip and we went over everything once again. 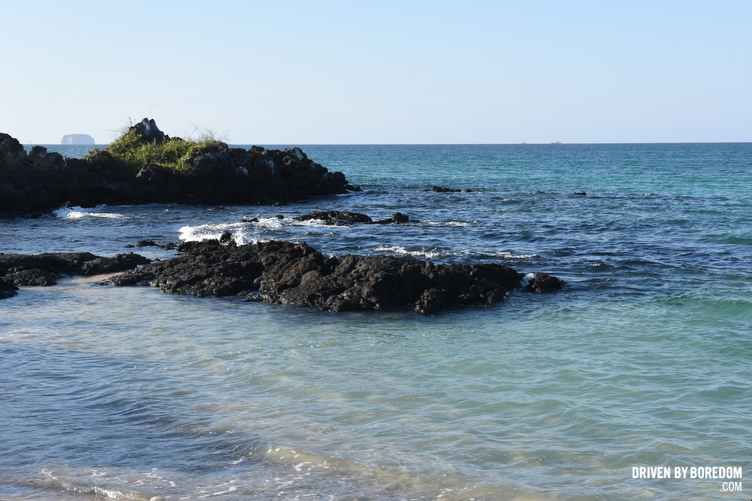 We saw marine iguanas, flamingos and frigate birds and we ended the trip with a quick dip in the water right next to volcanic rocks covered in the same bright red crabs from the Baltra dock. We returned to the Endeavour for dinner and afterwards we stood on the roof of the boat and watched large sharks follow the ship trying to catch flying fish out of the air. Despite the massive amount of time spent on travel and meetings the whole thing was fairly magical and I was excited for the next day. We would be snorkeling in the afternoon but first a hike to see the nesting grounds of Blue Footed Boobies. Unfortunately the snorkeling was not meant to be. At 6:15am the weather was announced for the day over the ship’s loud speakers. Breakfast would be served at 6:30 and it was time to get up. By the time my brother and I made it to breakfast my parents were sitting with another couple and my brother and I squeezed into a table next to two travel agents on vacation together. We would see them again soon. At 7:30 we boarded the Zodiacs and were taken to North Seymour Island. The hike featured a 200 meter walk over rocks that sometimes rolled out of the way and there were other options for people who didn’t want to risk the slightly treacherous journey into the booby nesting grounds. We of course decided to go on the hike, it was a decision we would live to regret. North Seymour island was pretty amazing. 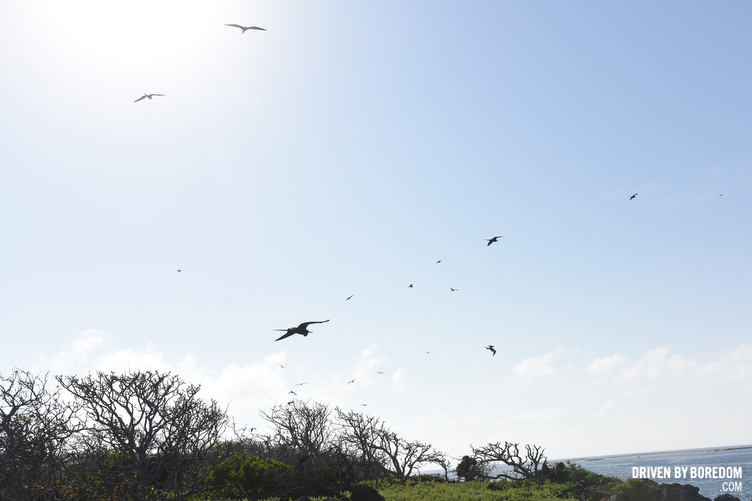 It was full of an amazing amount of birds and iguanas all of which barely react to humans. 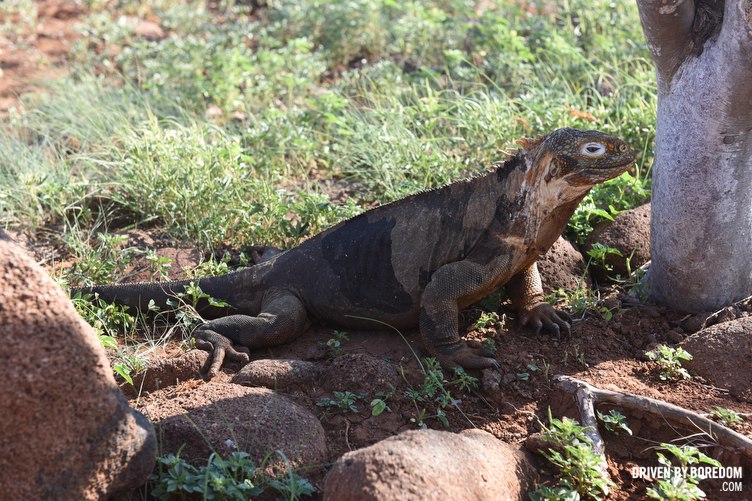 The land iguanas are way bigger than the marine iguanas and were found crawling all over the island. 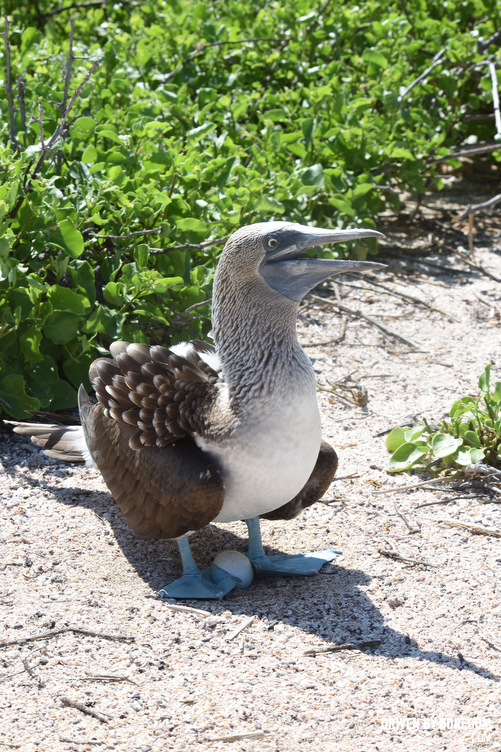 Blue footed boobies were everywhere, many standing on eggs to keep them warm. 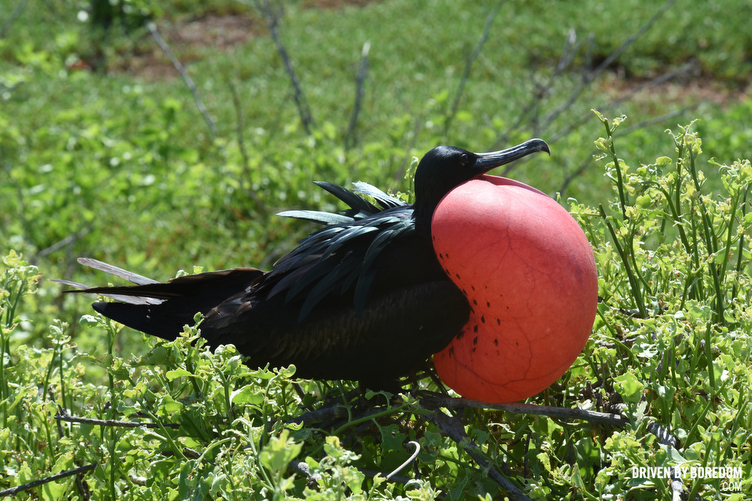 Male frigate birds puffed out giant red sacks to attract mates and tiny lava lizards would run past your feet so often you had to make an effort not to step on them. With no predators aside from birds none of the animals have any reason to fear anything. They just ignore humans and you can walk right up to them. It seems like paradise. The rocky path seemed a lot less treacherous than we were led to believe. There were rocks everywhere but nothing like the boulders I imagined when they explained the hike before we got off the boat. As we neared the end of the 200 meter rocky trail we could see the beach. At some point a rock rolled out from under me and my dad who was following behind told me to be careful. I told him I was fine and sort of laughed because I was thinking about how I was worried about my near elderly parents falling. My parents have spent my entire life worrying about me and now my brother and I are the once who feel like we need to take care of them. I was thinking about that very thing when my dad tripped. I turned around to see him laying on the ground and I leaned down to him and asked him if he was alright. He very calmly responded with “nope”. He asked me if his camera was okay because he decided to protect it instead of himself. He saved the camera but managed to hit his head on a rock. He warned me that there “might be a little bit of blood” when he took off his hat. That’s when I saw a bright red liquid start to flow down into the dirt. When I took his hat off I was horrified to see that he had a massive cut across his forehead and the skin was falling down into his eyes. I could see about an inch of his skull and told him to put pressure on the wound and to hold his forehead on. My brother was there too and told my mom not to look. The naturalist who was guiding us radioed for help and got out a first aid kit and gave him a bandage and my brother held it on the wound. At first he was feeling very sick and he seemed out of it but not concussed, more like in shock but by the time the doctor had arrived my dad was sitting up trying to drink water. He actually was mugging for the camera when I took his photo. The doctor took one look at my dad and started yelling in spanish. She made no effort to hide her shock when she saw my father’s massive wound which my mother didn’t really appreciate. Four of the men who had served as waiters at dinner the night before brought a stretcher out and carried my father off the island. They put his bloody hat over his head to protect him from the sun but as he was carried past us it looked like a corpse being carried out of a crime scene on a bad police procedural. My mother left with my bad but for some reason we continued on. My brother and I did not exactly enjoy the rest of the hike. Strangers kept coming up to us trying to comfort us and we just sort of drifted around in shock. My dad told me to use his camera since he owns a big zoom lens for bird watching so took a few more photos and just kept praying he would be okay. I don’t actually believe in god but it was Easter after all. One of the last things we saw before leaving the island was the rotting corpses of two sea lions. It was an ominous sign. When we returned to the boat my dad was being stitched up but we were told that my dad would have to leave the boat if he wanted to get an x-ray and would not be able to return because the boat was leaving the area near Santa Cruz and we wouldn’t be able to get back. We also had less than an hour to decide. It was an easy decision. After washing our father’s blood off our hands my brother and I packed up as quickly as possible before heading to my parent’s room to help my mom pack. My dad decided he wanted to keep his bloody hat as a souvenir so we even packed that but I decided to toss my jacket that they used for a pillow when they took my dad away in the stretcher. We carefully got my dad inside the Zodiac and headed back to the same Baltra dock and were once again greeted by the same sea lion in the exact same place from yesterday. We were met by a guide that was arranged by the tour company and he took us in a cab to a water taxi that took us over to Santa Cruz. From there an ambulance awaited us and my parents left to the hospital while my brother and I took our luggage in a cab to a nearby hotel. And when I saw near by I mean near by the hospital because the city of Puerto Ayora was 40 miles away from the water taxi. We quickly checked into the hotel and walked over to the hospital. My dad seemed okay and had just been x-rayed. There wasn’t much we could do but wait so my brother and I got some food and walked about a mile to the Darwin Center where they raised baby giant tortoises so they wouldn’t be eaten by the invasive rats brought over by pirate ships hundreds of years ago. It was cool to finally see a giant tortoise but to be honest baby giant tortoises just look like regular turtles and the adults there were behind big rock walls. It was pretty much like seeing them at the zoo and just sort of emphasized my disappointment that we were leaving this majestic place. When we got back my parents were back at the hotel and my dad was actually sleeping. The x-rays were negative and he had been given the clear to fly by the doctor. We couldn’t get a flight to Ecuador until the next day so we left my dad to sleep and got some more food. We bought my dad back a pizza because apparently there is a mediocre Italian restaurant in the Galapagos. The next day our guide picked us up at the hotel at 7am to take us to the airport but when I brought my bags down to meet him we discovered that we were not the only people from our group leaving early. The two travel agents were going to the airport with us as well. One of them had fallen off a Zodiac a few hours after we left the boat and hurt her knee very badly. She had to fly to Ecuador to get an MRI. We drove back across the island and back to the water taxi. We had to carry the woman in her wheelchair onto a tiny boat and then back into another van in Baltra. I also ended up pushing her around the airport which was cool because we got to board the plane before everyone else. When we took off for Ecuador I held my dad’s hand. He seemed okay but I just kept imagining the worst. I told him I loved him and almost started crying when the plane started moving. I had these horrible visions of my dad’s brain exploding from altitude. When we landed in Ecuador we found out we couldn’t change our flights because the airline had almost no seats available for the next three days. We ended up checking into a hotel room and spent my brother’s birthday arguing with airlines and insurance companies and each other over how we were going to get home. Eventually we just ended up buying wildly expensive tickets on other airlines and after another day of nightmarish travel we finally all made it home. My father went to his doctor the next morning and seems to be just fine. There was no sign of infection or brain damage and apparently the the stitches he received were really good so he might not even have that bad of a scar. Ending the trip early was a huge disappointment to all of us but I cannot tell you how happy I am that my dad is okay. It could have been so much worse. I also think it brought our family together as well. My brother told me that this experience was a lot more bonding than “snorkeling with sea lions”. He was right. Click here to see my photos from the 24 hours I spent in the Galápagos Islands… and no, I didn’t post any photos of the injury. So glad your Dad is okay! I enjoyed reading about your adventures and sorry you had to cut them short. You have a wonderful family!